Studio / T2 of 30 m2 on the first floor of a private residence with swimming pool, 50 meters from the beach of La Péguiere. This property, located in a 2-storey residence is facing south and has a beautiful sea view. - a beautiful bathroom with walk-in shower, a separate toilet, a sleeping area with a trundle bed 2 places + 1. 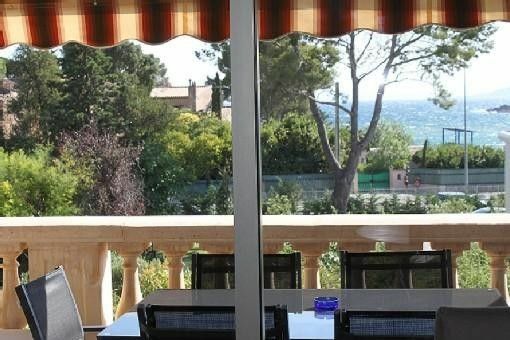 -a beautiful terrace of ten square meters equipped with a table and 6 chairs and a modern garden furniture. The apartment has a TV and a wifi connection. Les tarifs varient de 400€ à 900€ selon la période de la saison. LES LOCATIONS SE FONT DU SAMEDI AU SAMEDI, MAIS LE SITE NE PERMET PAS DE METTRE LES RÉSERVATIONS A CES DATES LA. Cordialement.